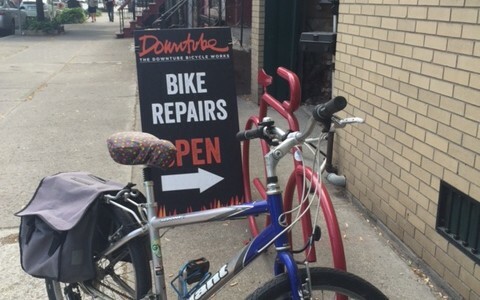 Yesterday I walked my bike to the Downtube for a quick tire repair – awesome. 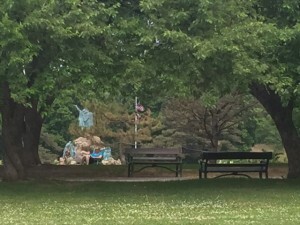 I could walk the 1.5 or so miles easily, wait in the beauty of Washington Park for the 20 minutes it took them to replace my tube, and then pay a mere $8 for the tube and $10 for the service. An incredible deal. AND I left my water bottle in their store and received an e-mail soon after asking if it was mine and, if so, when would I come to get it. 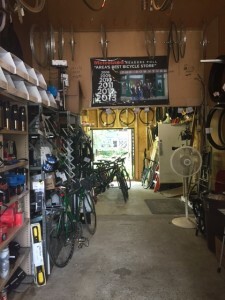 Temp service/store at the Downtube. I am not a frequent customer, but I will buy my next saddlebags, lights and new bike from them. This is where I see sustainability taking us. To local service that frees us to choose how we will travel, what we will eat, and how our money is spent. Local service that occasionally gives us an unexpected 20 minutes in the local park, or a chance to walk past some other stores we haven’t yet visited, or the opportunity to say “hi” to the people sitting on their stoop as we walk past. I am not talking about the idyll, here. Most people still do not say ”hi” back and I did have trouble relaxing for those 20 minutes. Seriously, it was hard for me to do. I felt like I needed to buy an expensive latte to justify my time there, or write the outline to this blog entry, or catch up on my FB friends’ lives. But I worked very hard to resist those compulsions and I sat in the sun and read my book and was surprised when it was time to retrieve my bike. Perfect. When I do a quick Google search I find three bike shops within reasonable distance from my home, in Albany, NY. We live in the old suburbs that were created in the surge of expansion in the 1920’s and that are now really part of the city: an easy 2.5 miles from the Hudson River. The Downtube is downtown, ripe for traffic from government employee bike commuters, and cozily positioned near the park and some excellent bars and restaurants. 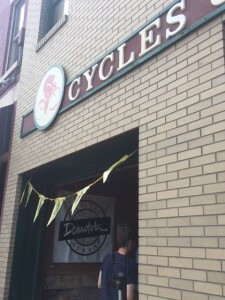 There is a new place in the growing warehouse district just north of downtown called Broadway Bicycle Co. and there is CK Cycle LLC up on Central Avenue, a bit more in the mall and strip mall zones of Albany. I love this. This is the first time I can remember having a choice…and none of these is a chain store. It is ideal that these are in the city, so people can start to rely on their bikes in serious ways. And I believe the bike stores understand their value to these commuters, and that they work hard to live up to that expected value. The Downtube had a fire on the first day of spring in the apartments above them. Their store is closed but they have managed to open a sort of garage annex section that is tiny yet meets all the service needs and boasts just enough display to entice looking. They are personable and present. While I was dropping off my bike one other repair came in and a man stopped by with his two kids to look for bikes for them. 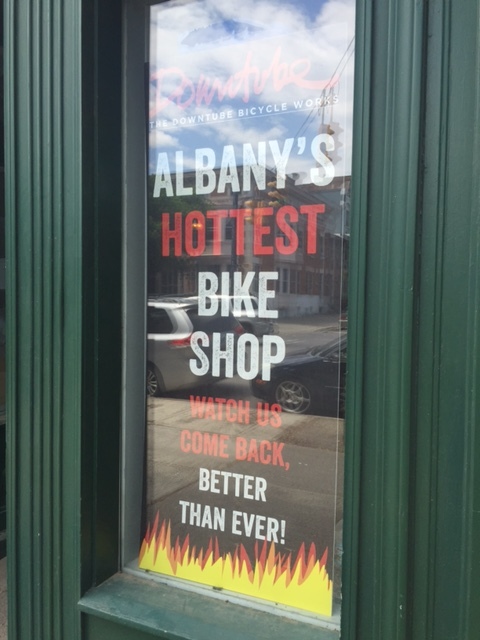 I applaud their moxie and their sign proclaiming that they are the hottest bike shop in town. I am now invited to their re-opening party, and I am impressed yet again with the notion that this business tragedy is helping them to be creative and re-engage with customers. I see a future in the warehouse district where bikes are the more normal transit. People can come into the city and borrow from the Albany bike share to explore the funky breweries (yes, there are some) and art/craft enterprises in the area. The bike shop in the mall area might eventually be a focal point helping us to control the traffic stupidity associated with suburban consumerism (it’s a good thought). And in every case, we are expanding options for each city/suburb dweller. Albany has a bike master plan and now is up around 150 miles of marked bike-share roads. 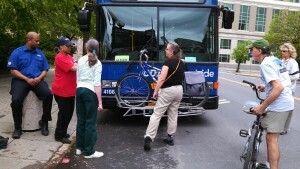 CDTA buses have bike racks for excellent commuting options. The bus system has installed bike carriers and encouraged bike racks throughout the city. I really love that Albany is becoming a city of many transit choices. I see it throughout the state and hope it is spreading just as fast or faster elsewhere. NYC currently has citibike system and over 1,500 miles of bikes lanes with a plan for 2,000 of their 6,000 miles of roads to be bike friendly by 2020. And maybe we are all more accepting of these choices. I was riding my Segway home last week and I stopped for an electric wheelchair/scooter at a crosswalk. I lifted my chin to the older, Fedora’d, black gentleman. “Nice ride”, I said. He tipped his head to me. “That’s a nice ride, too”. Do math to prove you are human!